There are tons of great online casinos out there. Yes, we’re obviously the best. And yes, other casinos will tell you that they’re the best. If you choose to play elsewhere, we’re confident that you won’t be taken care of the way Prism takes care of you, but let’s be real. Some of our competition is solid and we wouldn’t be honest if we said we were the only good game in town. But it’s not about the sites claiming to be the best that are actually good that you need to worry about. It’s the sites claiming to be the best that are rogue that you should be very afraid of. So how do you spot a rogue online casino? How do you know if a casino doesn’t operate within the rules, scams players out of their money, and doesn’t play nice? There are certain things you can look for and we’ve got five big things that are major warning signs, so pay attention. This is kind of a strange one. You’d think that terms and conditions are there to restrict how easy it is to withdraw money or earn a bonus. But the truth is they exist to make sure everyone plays fairly and understands the rules. We have restrictions on our bonuses, as do our legitimate competition. Sites that don’t are suspect. For example, if an online casino tells you that they’re going to give you $500 in cash when you deposit $500 and that there is no catch or rollover requirements, there’s a good chance that they’re not telling you the whole story. Stay away. Rogue casinos don’t tend to spend a lot of time and effort to keep people up to date on what’s happening in the biz. They concern themselves primarily with suckering people into depositing without any intention of paying them out. So why is having a blog or a news department a sign that an online casino is legit? 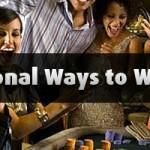 Well, if a casino is taking the time to blog, that’s a sign that they like to actively engage with their community — and that they’re interested in more than just making money. An online casino without a blog or updated content just doesn’t care. If you need to fill out a form to contact customer service, you probably want to find somewhere else to play. When you need help, whether with depositing, withdrawing, or playing a game, you want help now — not 24 to 48 hours from now. The best sites list their contact information on the homepage. And the top sites offer toll-free support and live chat so you can get help when you want, the way you want. It’s April, so if you’re still seeing a Halloween or Christmas promotion posted on the website, you’ll want to steer clear of that online casino. The top online casinos create tailored promotions based on the month, season, or holiday. Rogue online casinos will feature too-good-too-be-true promos that haven’t been updated in forever. If an online casino is boasting about their latest online casino game that’s been out for 5 years, chances are they haven’t added anything new in a long time. A simple Google search of a game advertised as new will reveal how new it actually is. If it’s been out for ages and an online casino is claiming that it’s brand new, they’ve gone rogue. Now you know how to spot them. Beware.